Corrections and retractions time. Though I totally stand behind my creation last year of the Meyer Canadian Semi-Sour, I was perhaps wrong when I described the wondrous Meyer lemon as “partly an orange.” Turns out, it might actually be partly a Mandarin orange. That would make sense since la wiki tells us that it was once actually a primarily a houseplant in China. The humble plant’s destiny was forever changed, however, after being discovered sometime around the turn of the 20th century by a U.S. Department of Agriculture employee named Frank Nicholas Meyer. Anyhow, with the return of the Meyer lemon to stores in my vicinity and with my recently rekindled interest in the eggier side of the sour family of cocktails, I decided to see if the juice of the more edible lemon worked as well with 100 proof bourbon as it did with the ever-so gentle, and merely 80 proof, Canadian Club I used last year. I’m happy to say that, if anything, it’s even better — as long as you like your cocktails boozy and sweet as heck. If you’ve read my other recent sour recipes, you can probably guess what the drill will be. Combine the bourbon, juice, sugar and (if you’re using them) bitters in a cocktail shaker without ice. Shake the contents to emulsify the egg white. Then, add ice, shake a bunch more, and strain into a well chilled rocks glass. Garnish with cherry and salute the late citrus pioneer, Mr. Meyer, and mourn his untimely and mysterious passing in 1918. Re: bitters. I originally tried using Angostura in this, but found it an unwelcome distraction. Then I tried it without bitters at all, and found the drink absolutely wonderful. Then, I tried it again with Regan’s Orange Bitters and found the drink tasted tangier and even sweeter and not quite as much to my personal liking. However, one of my test subjects here at DOTW Manor was very pleased with this version, so I’m leaving you the option of throwing the orange bitters in. Try it both ways, I say. Finally, there is the question of how you determine that you’re using half an egg white. I’m sure there’s a way to do that with measurements — though measuring egg whites can be a hassle, or you can do like I’d probably do and just sort of eyeball it. This time, I took the easiest and least wasteful way out and just doubled up and made two Meyer 100 Proof Bourbon Semi-Sours at the same time. This is a drink worth sharing. You’ve never heard of the today’s Drink of the Week for a very good reason. The Meyer-Canadian Semi Sour, as I’ve named it (any other suggestions?) is the first DOTW that is pretty much entirely my own variation on a cocktail classic. While I wouldn’t say this was a great invention that happened by accident, I did sort of stumble over it. 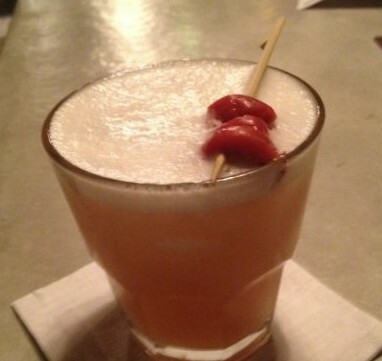 As I hinted at in my post on the whiskey sour some time ago, I find that particular cocktail staple to be extremely sour. Truth in advertising, I guess, but while many love it, for me it’s a drink for which I feel more respect than affection. Then, one day last week, I saw a small sack of Meyer Lemons on sale for a reasonable price at my local branch of the newish Southwestern grocery chain, Fresh and Easy. If you’re a foodie, you may know this seasonal citrus as an ingredient favored by such culinary legends as Alice Waters. I just like the idea of a lemon that’s partly an orange. Searching around for cocktails made with the juice of the crossbreed fruit, I tried one drink which I may return to if I can find another bag. On a whim, I then decided to try out my own version of a whiskey sour, using the juice of this decidedly sweeter lemon which, unlike the fruit that Trini Lopez sang about, is entirely possible to eat. For some reason I decided to use slightly less juice than most recipes call for, slightly more sugar and about double the egg white. Since I’d already had one drink, I decided to steer away from the hundred proof boozes I’ve been leaning toward and just go with good old 80 proof Canadian Club. The result was, for me, a small slice of near paradise. Combine the ingredients in a cocktail shaker without ice. Shake vigorously to ensure that the egg white is fully emulsified — you should have a nice yellow froth going. Add ice and shake again, even more vigorously and longer. Pour into a chilled martini, wine, or rocks glass with a maraschino cherry for color and an added dash of sweetness. Try not to drink it all it once. I also sampled the then unnamed Meyer-Canadian Semi-Sour with both 100 proof Canadian Club and Rittenhouse Rye, a personal favorite, but the stronger flavor of the 100 proof stuff overwhelmed it in both cases. 80 proof Canadian Club seems to be the perfect thing here, and I suspect this would work almost as well with one of CC’s competitors. I even more strongly suspect it would be outstanding with Crown Royal, if you’ve got that kind of money to throw around. It’s a shame I can’t try it with the 86 proof Canadian Club that my grandma used to drink back in the last century and which presumably was closer to whatever Don Draper was swigging decades prior, but the contemporary version works so nicely that I have a hard time complaining very much. By the way, if you can’t find Meyer Lemons in your area at the moment and are suddenly determined to try them, you can order a very large quantity here.